Angel Pazmino, pair of armchairs with side table, wood and leather, circa 1970, Brazil. Armchair: Height 70 cm, seat height 35 cm, width 63 cm, depth 70 cm. Table: height 44 cm, width 41 cm, depth 41 cm. Nicoletti Salotti, Pair of Armchairs, Red Leather, circa 1970, Italy. Measures: Height 71 cm, Width 107 cm, Depth 92 cm. 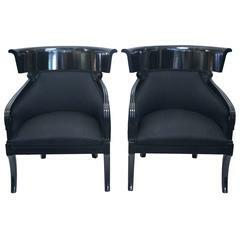 Pair of neoclassical armchairs, black lacquered wood, circa 1970, Austria. Measures: Height: 80 cm, seat height: 37 cm, width: 70 cm, depth: 45 cm. 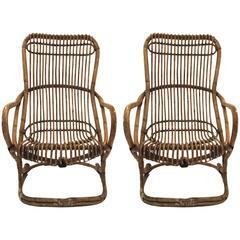 Pair of armchairs, bamboo, circa 1970, Italy. Height: 102 cm seat height: 41 cm, width: 61 cm, depth: 80 cm. Pair of wood frame and leather armchairs. A 1970s pair of Leather armchairs with a scalloped shape back and an extremely handy magazine much on the side. Perfect amount of age with no splits on the leather. Pair of 1970s pagoda armchairs.